Price Range £256 - £314Price RangeSimply drag the slider bar to set your price range. 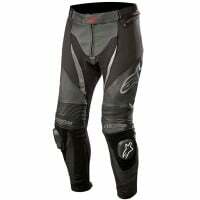 Alpinestars are a world leading manufacturer of professional racing products and leather jeans are no exception. From F1 to Karting, the World Rally Championship to NASCAR, Alpinestars work with top drivers and riders to bring design innovations to all aspects of professional motor-sport. Great. 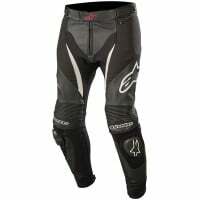 Bought these after a disappointing experience with the Missile leather trousers from Alpinestars which were too tight. These Track trousers are anything but a disappointment. 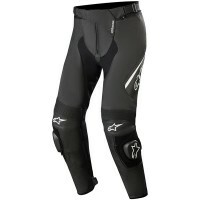 Comfortable, confidence inspiring protection and, look good. Very pleased. Sizing was spot on. 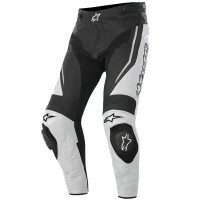 Yet another great product from Alpinestar. 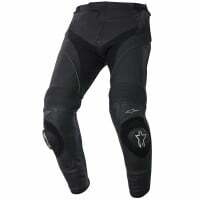 At first tough to get comfy in but after a few hours of use the leather breaks in and your sorted. The feeling of having the best protection when wearing these is priceless. Highly recommended and as usual great customer service from SBS. 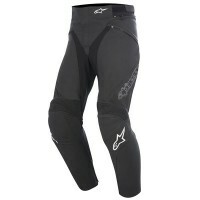 Bought them pants due to compatibility wih G pro jacket that I had already. Size W 34 / short fits well, I usually wear 30-32 waist, I'm muscular 77kg, 174cm. Alpine clothes sizes tend to be 'fits small'. Pants are comfortable and well protected, quality is excellent, I highly recommend if you are into that sort of sporty style, note that they are a combination of leather and more flexible materials where needed.